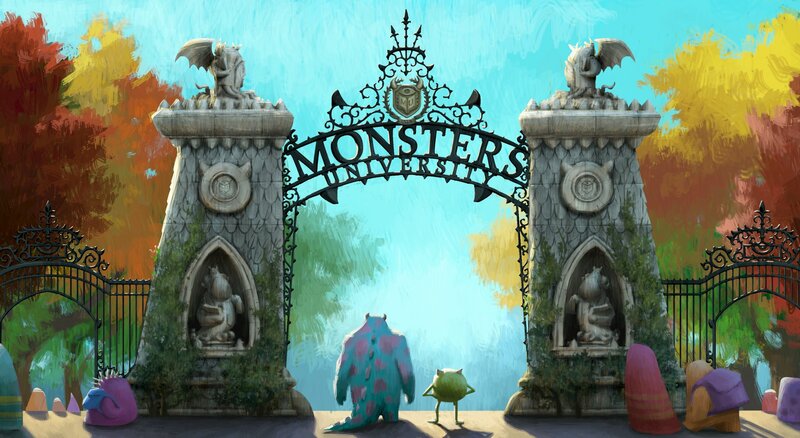 We have been eagerly anticipating new details, concept art, and video from Monsters University. After the film’s impressive viral campaign kicked off with a website and advertisement for the fictional school, Pixar has been keeping the prequel close to its chest, as we have yet to see a full-length trailer. There may be some new material debuting at Toy Fair next week during the scheduled press event previewing toys and merchandise that will tie into the film. Now, there is a brand new featurette that gives us a better overview of the film’s plot and features new footage and stunning new concept art. Watch it after the break! Animation Fascination has posted the Monsters University featurette (via Upcoming Pixar), which appears to be the one that will be included with the upcoming re-release of Monsters, Inc. on Blu-ray. Be aware that there is far more information about the plot in this video than we have heard to this point, but rest assured that the studio is rather good at keeping essential story points from the public.